What is the Boy Scouts of America all about? The Boy Scouts of America provides the nation’s foremost youth program of character development and values-based leadership training, which helps young people be “Prepared. For Life.®” The Scouting organization is composed of nearly 2.3 million youth members between the ages of 7 and 21 and approximately 960,000 volunteers in local councils throughout the United States and its territories. Scouting provides unique, life-changing experiences youth can’t get anywhere else. Troop 56 is a community Boy Scout troop serving the tri-state area of Arizona, California and Nevada. We have been serving the youth of Bullhead City, Laughlin, Needles, Fort Mohave and Mohave Valley for 21 years and counting. Troop 56 meets at St. John Evangelical Lutheran Church, located at 1664 Central Avenue in Bullhead City. Membership is open to anyone meeting the requirements set by the BSA National Council. We are affiliated with the Las Vegas Area Council (formerly Boulder Dam Area Council) of the BSA. We focus on the development of character and skills using the principles of the Scouting program. We teach duty to God, country, family and self. We believe that achievement is limited only by the imagination, and that any boy wishing to advance in Scouting should be provided the support, resources and tools that will make his goals attainable. Adult leadership is provided by trained adult volunteers, consisting of the Scoutmaster, his Assistants, and the Troop Committee. The Boy Scouts of America places the greatest importance on creating the most secure environment possible for our youth members. To maintain such an environment, the BSA developed numerous procedural and leadership selection policies and provides parents and leaders with resources for the scouting program. All adult leaders involved with the scouting program MUST go through Youth Protection training and be registered with the Boy Scouts of America. The Boy Scouts of America is committed to providing the safest environment possible for our youth members. We know that millions of youth members, their parents, and volunteers depend on Scouting to maintain its high standard for youth safety. Because of this, youth protection is a critical component of our program. For any boy (or adult) interested in joining we ask that you check us out. Come to a couple of meetings and get a feel for the program and the people involved. Ask questions. Our meetings are open to visitors. Our troop meets weekly on WEDNESDAY nights at St. John's Evangelical Lutheran Church on Central Avenue in Bullhead City, from 7:00 PM until 8:30 PM. Meetings start promptly at 7:00 and the doors open shortly beforehand. We normally meet in the "basement" which can be accessed by the door located next to the storage shed in the lower level parking lot. Any boy who is either 11 years of age at the time of registration, or who has completed the 5th grade (even if they are not yet 11 years of age), or who has received their Arrow of Light Award through the Cub Scouting program AND is at least 10-1/2 years of age, but who is otherwise not yet 18 years of age is eligible to join. It is said that 3/4 of Scouting is "outing." 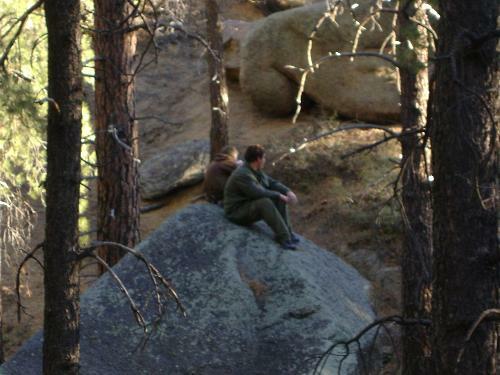 The Scouting program relies heavily on the outdoors. This provides the Scouts challenges that give them the opportunity to grow and learn in meaningful ways. Outdoor adventure is the promise made to boys when they join Scouting. Boys yearn for outdoor programs that stir their imagination and interest. In the outdoors, boys have opportunities to acquire skills that make them more self-reliant. They can explore canoe and hiking trails and complete challenges they first thought were beyond their ability. Attributes of good character become part of a boy as he learns to cooperate to meet outdoor challenges that may include extreme weather, difficult trails and portages, and dealing with nature's unexpected circumstances. Scouts plan and carry out activities with thoughtful guidance from their Scoutmaster and other adult leaders. Good youth leadership, communication, and teamwork enable them to achieve goals they have set for themselves, their patrol or squad, and their troop or team. Learning by doing is a hallmark of outdoor education. Unit meetings offer information and knowledge used on outdoor adventures each month throughout the year. A leader may describe and demonstrate a Scouting skill at a meeting, but the way Scouts truly learn outdoor skills is to do it themselves on a troop outing.